THE LETTER 55 & 56 Spring/Summer 2014, pages 103-118. For the psychiatrist, negative symptoms are viewed as a sign of mental illness marked by a symbolic deficit. Symbolic deficit flags the imperative of the Real and as such is viewed in an utterly different way by the psychoanalyst who views all meaning-making – whether the phantasy of the neurotic or the positive symptom, the delusion of the psychotic – as a means of compensation, a means of constructing a symbolic solution in the face of the Real. Ab-sens, understood as absence or absence of sense, directly indicates the Real. While at the core of the negative symptom, ab-sens allows the question of the subject to be posed. This unique pivot between ab-sens and the subject to come requires an introduction to the terms meaning, sense and ab-sens, in the hope of prompting a reappraisal by the non-analyst, of psychoanalysis as a therapeutic engagement that differs from any other narrative approach. 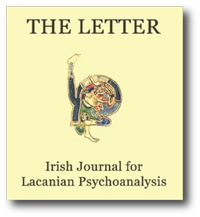 I wish to introduce this paper by making reference to an editorial in the September 2014 issue of the British Journal of Psychiatry entitled Psycho-pathology as the Basic Science of Psychiatry.3 This is in order to highlight commonalities but also differences in the approach of psychiatry and psychoanalysis to the questions posed for clinicians by psychosis.